A User submits a form that has the Rails attribute remote=true on the form tag which makes the form submission happen via AJAX. See the Rails guide for more information. 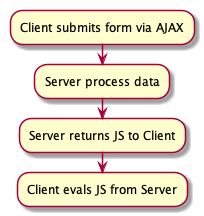 The server receives the data payload and processes a response. The Response from the server is a blob of JS not JSON that usually comes from a matching name.js.erb template. The User's browser receives the JS blog and evals the JS to update the page.